I love orange and chocolate together and I remember my mom making orange chocolate truffles as a kid. She used the old double boiler method to make her truffles. For me that’s too much fuss and more mess to clean up. I melt my chocolate in the microwave with the butter. I start with one minute then take it out and stir. Then I microwave 30 seconds at a time being sure to stir well each time until its all melted together. After the mixture is melted and smooth I add my extract and a dash of salt. Then I let it chill in the fridge for about two hours. 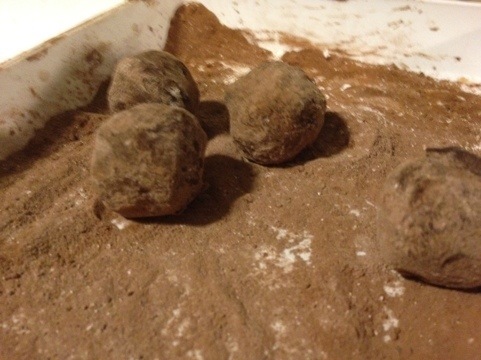 When my truffle mixture is firm I take it out and roll them into balls. You can cover your hand in a plastic bag to keep it from getting messy. 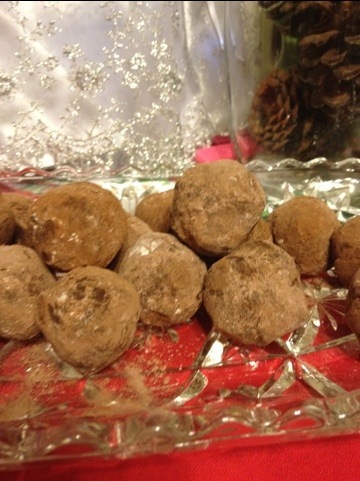 I rolled my truffles first in powdered sugar and then in cocoa. These are so delicious and make great gifts. People will think you slaved all day. I got about 30 truffles out of this recipe. Seriously… You could but they’d get a little messy so you’d have to dunk them in chocolate to make a hard shell instead of rolling them into balls. I would actually pour the mixture onto a brownie pan to cool. Then it would cool flat and you could cut the shapes and then dunk them in chocolate. I might have to try this. Thanks for the idea!!! !